Daily Page: Build a better writing habit. Build a better writing habit. Daily writing prompts & helpful writing courses. 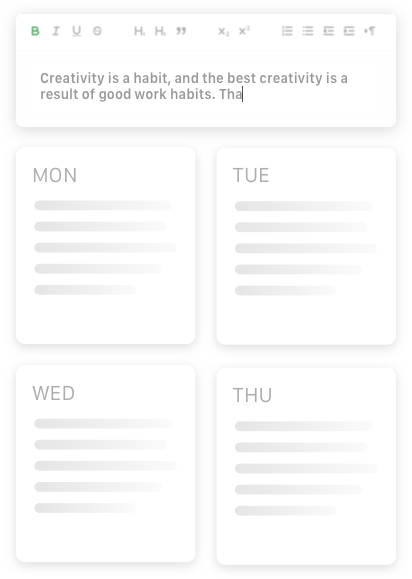 Create a daily writing routine with a collection of creative prompts. Receive a reminder email every day to write. Freewrite your page or select a prompt. Track your writing and nurture inspiration. Kickstart your work & improve your technique with our writing courses. We’ve worked with professional writers and editors to create writing courses that will give you the structure for turning your ideas into actual content. From blogging to critiquing to screenwriting, our courses will provide insights and help inspire you to start your next writing project. Your motivation to write starts today. Hundred of creative writing prompts. Access to structured writing courses. Writing stats and a personal writing score.